Greetings, and welcome to Isometrics, a slightly askew analysis of video games. Ordinarily, this would involve training a literary eye on gaming past, present, and future to see if that perspective can reclaim games that were otherwise forgotten, or find a new solution to gaming dilemmas. Here though, we are going to explore two things that are very special to me: Doctor Who and obscure computer games. There are an absolute ton of Doctor Who video games, especially if you count the unofficial ones, so for the purpose of this piece we are going to focus on only the games that were officially licensed by the BBC, just to show you British geeks that your License Fee money is not going to waste! There is a point to all this, beyond the celebration of Doctor Who on Geek Pride: the Doctor Who games are, in short, a reflection of the British history of computer games, and so to talk about these games we do have to talk about the computer world in Britain. In 1982, the British Broadcasting Corporation decided that this funny old computer business was probably going to be quite important, and so decided to create a television show to demonstrate the power of the forthcoming Micros. To this end, they created a set of specifications that were actually quite tough for 1982, and then negotiated with the major computer companies of the time, in particular Sinclair Research (who were at the time finishing up the legendary Spectrum), Newbury Laboratories (who created, among other things, the Grundy Newbrain, and were the company the BBC actually wanted), Dragon Data (who no one remembers for good reason, the good reason being the Dragon 32), and Acorn. Eventually the Acorn Proton was chosen, and became the BBC Micro, which ended up in every school in the land, and the focal point of several computer based shows until the end of the decade. 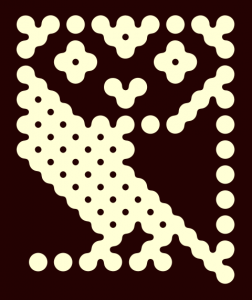 The Owl as it looked before “orly” was a thing. “Now,” I hear you cry in your sleep, “that lecture’s all well and good, Old-But-Not-Old-Enough Man, but what does this have to do with Doctor Who?” Well, the answer is simple: Everything! Computers were part of the props, were used in creating the effects, the Teletext technology that allowed news and literature to be available as you watched television was powered by a small cluster of the things, and television shows such as “Micro Live” showed you how you could do anything, from write hello world to creating robots, using your special buddy. And then there were the games. The BBC managed to get around the ethical mire of marketing commercial software based on a property that was funded by the tax and license payers of the country by claiming it was part of the computer literacy project (unlike now, where they simply don’t bother), and so, in 1983 we were blessed with the first official Doctor Who game, Doctor Who: The First Adventure, a game that, like most of the BBC’s games at that time, turned out to be a crap set of minigames. And my oh my were they crap! You had a dodgy maze minigame, where you move a stringy dot through the dreaded Mine of Awkward Collision Detection, before moving on to the dreaded Awful-yet-obligatory Frogger Clone Escape. That level, titled creatively “Prison Escape,” is probably the most carcinogenic, with it’s painful palette serving only to blind in a kaleidoscope of hot pinks and murky blues. The final two levels, an uninspired shooter and an inexplicable 3D minesweeper-esque game, smack of desperately poring through old magazines for simple BASIC games to add to the package. Credit must go to the poor sod who typed up the instruction screens, and thus had to have an imagination rivaling that of CS Lewis to fashion any story out of the blocks on screen, let alone a story even tangentially related to the good Doctor!